I want to share with you the best Christmas gift I could imagine. It’s a long story (and most of the good ones are) but I’ll boil it down for you. I was visiting a center yesterday and a team member stopped me and said “Luke, I have someone that wants to meet you- do you have a minute?” Of course. So in rolls Mr. Martin. Click on his picture. There he is. Grinning ear to ear. One leg. An arm that stopped working 14 years ago because of a stroke. Mr. Martin credits his dispatcher at the cab company for saving his life. He was alone in his apartment when the stroke hit. Massive cerebral hemorrhage. He fell to the floor and couldn’t get up. After struggling a long time he finally said to himself “well, I’m done. Might as well go to sleep.” He talks with that sort of thick- “been there done that- no big deal- life doesn’t owe me much” attitude. (Think John Wayne meets Jimmy Stewart.) Well when he didn’t start his cab the next morning his dispatcher, the retired police chief of Great Neck, New Jersey called law enforcement and EMS and told them to get over to Mr. Martins apartment. Something had to be wrong if John didn’t show up for work. They saved his life, but doctors said he would never walk again. He eventually moved to Florida to be near his sisters. He got himself a place and settled in. He has the sweetest pup. An English Springer. Named him Harley after the motorcycle. Mr. Martin had a lot of choices for rehab but he chose Palm Garden. He said he has been in two others through the years and they don’t compare. 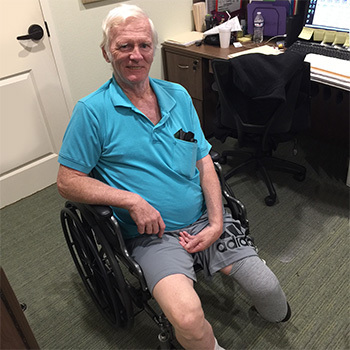 I asked him why and he said “because at Palm Garden they treated me like a member of their own family, you can tell they care.” He said that his wound care specialist was so tender and caring- even as she was packing his open wound with gauze. He said they both celebrated the day she told him she couldn’t even get a cue tip in there anymore. He said therapy was firm but supportive. He said their favorite thing to say was “John, good job! Now 10 more!” He said they helped him accomplish more than even he thought he could. He said Hannah got him to the point where he could balance on his one leg for a long time. (A must if he’s going to be independent again.) When he sat down and it cramped up- she massaged it for him. Christmas isn’t about money or presents. It’s about people. It’s about feeling. It’s about faith. And it’s about our ability to put a smile on Mr. Martins face through perfect execution of The Palm Garden Way “…it’s my pleasure.” The gift is ours to give and to receive. Best gift I could imagine. We are just so proud of our Palm Garden Family.